High on the list of requirements for this family was space for parties. 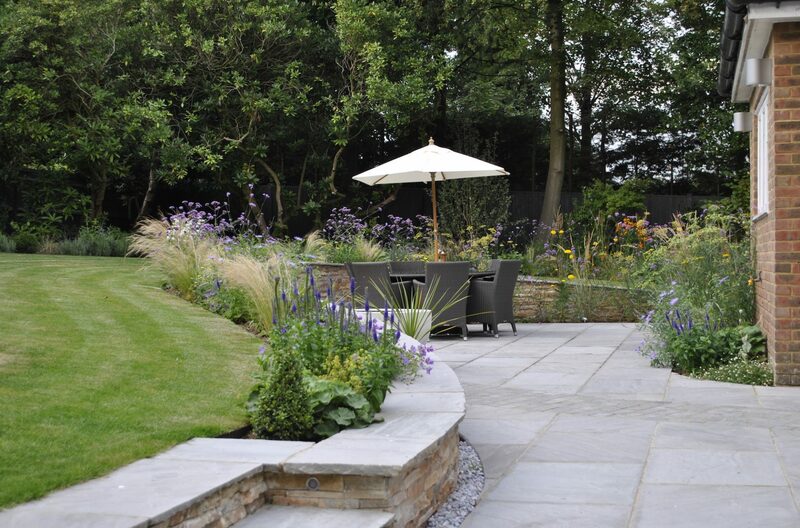 The house was being remodelled and the garden needed to be completely redone to compliment the new house. The garden was large but completely flat and featureless and had serious problems of overlooking along the longest and most visible boundary. 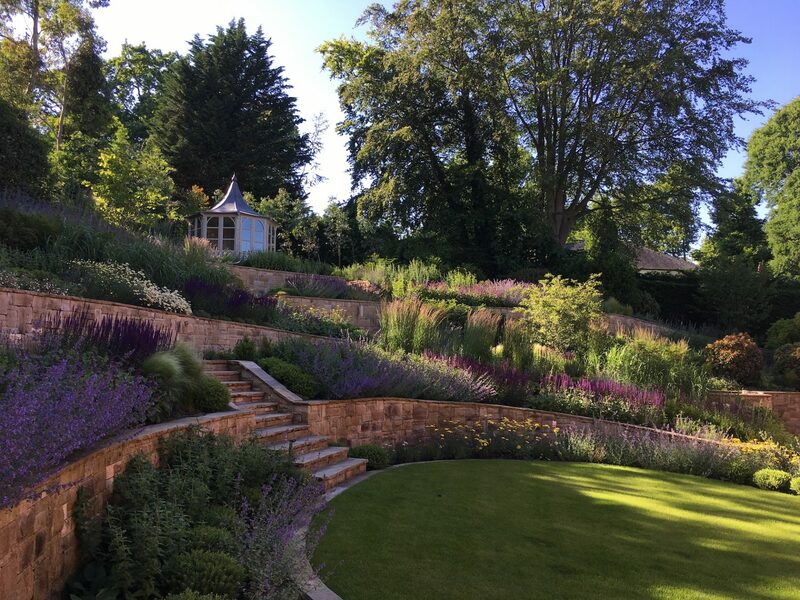 The clients wanted the garden to be contemporary and to make them feel that they were on holiday. A generous Limestone terrace flanks the house and provides the all important party space. 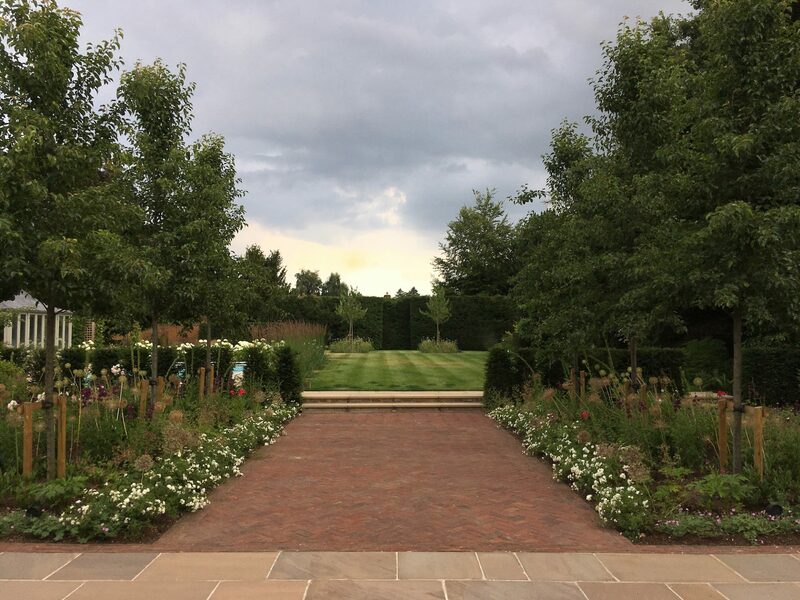 Divided into two distinct areas by a ‘blocky’ planting of evergreens, the day and the evening zones feel separate, yet still connected. A stunning glass water bowl made from a recycled submarine window creates a unique water feature and a focal point from the main rooms of the house. A large circular lawn surrounded by colourful perennials planted in large swathes creates the brightness that the clients requested. Meanwhile in the ‘evening area’ a pallet of paler flowers stand out better in the twilight. Extensive garden lighting completes the atmosphere. Meadow turf with a meandering path through pink and white cherry trees transformed an old messy bank from an eyesore into a feature in the new garden. A west facing terrace with contemporary steel pergola ensures that the last rays of sun can be enjoyed whilst sipping a cool drink on a summer’s evening.